Home > Living Trusts > What If I Want to End My Living Trust? Living trusts provide a valuable opportunity for many individuals. They have a range of important uses, including avoidance of probate and the safeguarding of assets to ensure you are well looked after in the event that you are incapacitated. But, of course, circumstances sometimes change. It is not uncommon for a living trust to be established, only for the settlor (that is, the individual establishing the trust) to later decide that they wish for it to be scrapped. So how do you go about doing this? A living trust is a trust created during the life of the settlor – in contrast to a testamentary trust, which is established upon their death. Living trusts are often established by individuals that want to make provision in case they are injured or become ill. Similarly, many people set up this type of trust in an effort to avoid tax or probate. 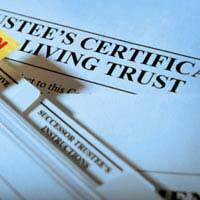 In a living trust arrangement, the settlor may also be the trustee and beneficiary. This makes ending a living trust comparatively easy. The distinction between revocable and irrevocable arrangements is amongst the most important when it comes to living trusts. As the name would suggest, a revocable living trust can be changed or revoked at any point. Irrevocable trusts, on the other hand, only end when all assets in the trust have been disbursed – often many years after the death of the settlor. As such, only revocable trusts can be ended before this point. You can do this by drafting an ‘amendment and restatement’. This document supersedes the original trust document, restating its aims – and, if necessary, abolishing the trust altogether. If you want to make a more minor change, you need not abolish the trust and set up a new one. Instead, you can draft a trust amendment that details the changes. This can be thought of as similar to a codicil, which is designed to add to or alter a will. You should remember, though, that even revocable trusts generally cannot be scrapped or altered between the death of the settlor and the final disbursement of assets. This is to ensure that the wishes of the settlor are carried out as intended. The flexibility of a revocable trust means that many people opt for this arrangement by default. It is important to remember, though, that revocable trusts have some significant drawbacks. Because of the control maintained by the settlor in a revocable trust arrangement, the assets settled are almost always still treated as the property of the settlor. This means that any tax benefits that would otherwise have been derived are no longer available. Revocable trusts, while more flexible, are therefore not suitable in every circumstance. Establishing, altering and ending a living trust can be a complex and lengthy process. It is also one that must be completed properly if it is to stand up to legal scrutiny. It is therefore vital that you take proper legal advice before continuing.